This was just the kind of entertaining read I needed to start the february releases with. I realised that I had noted a few release dates wrong on my spreadsheets so there are at least two books I missed in January(than originally estimated)! Maybe I will try to get to them in the remaining few days but there is no guarantee. To all those bloggers who are reading this post (the cover page above leads back to the Netgalley link which is still active), I am sure there is a little something in this tale for all of you. 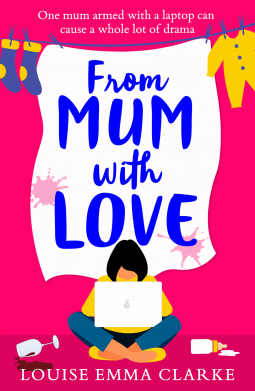 The story begins with Jess who has been home with her fourteen month old daughter since her permanent maternity leave began and frustration is mounting in her life and she’s feeling bogged down by it all. Then her husband suggests blogging as an outlet, especially since she has always wanted to write. With just this brief introduction, I can already draw a parallel with my own reasons to start blogging, including the nudging part! Although the blog is a parenting/maternity blog (a topic I know only through observing my relatives), the core issues stay the same. The level of revelation that you are planning to put forward in the blog. She has a tight-knit group of friends to rely on, a very supportive husband (even though she uses him to vent most of her pent-up frustration), a loving sister and doting parents. With this strong support system behind her she enters uncharted territories and it becomes her new normal. Her foray into social media is sudden and viral and it has all the ups and downs required to make it a good read. The letters she writes to her daughter, are the highlight of the book. They are well written, emotional and very vivid, making the entire story worth reading. I enjoyed the book, even more so because of the reasons I mentioned in the beginning. I think it might appeal to non-bloggers as well since it just the story of one women and her brood. The repeated use of ‘babe’ put me off a little, but other than that, I would recommend this to all on the lookout for a light-hearted but still emotional read.